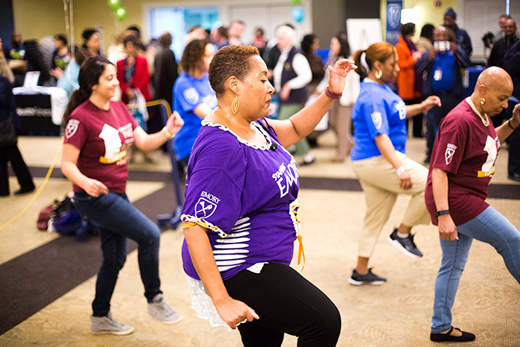 This month, the Healthy New YOU Expo returns to Emory to help employees start the new year with health and wellbeing in mind. Set for Jan. 11, this popular event features cooking demos, mini fitness classes, meditation sessions, talks by wellness experts and exhibitors from the surrounding communities in the areas of nutrition, fitness, stress management, ergonomics, finance and more. The expo will be held at five Emory locations this year. The main site will be at the Woodruff Physical Education Center (WPEC) on the Emory University campus. Satellite expos will be held at Emory University Midtown Hospital, Emory Saint Joseph’s Hospital, Emory Johns Creek Hospital and Emory Orthopaedic & Spine Hospital. All of the expos will run from 10 a.m. to 2 p.m.
One of the featured speakers this year is Emory graduate Alok Despande, who is presenting “Get Your Money Right,” a strategy course on how to organize finances and follow a seven-step path to gain financial freedom. “Alok will help you understand the headwinds you face when dealing with money and how to identify the most important number in your financial life,” McMillian says. The main location in Woodruff PE Center will feature an exhibit hall where a vegan cooking demo will be spotlighted and a separate area for group activities like compassionate meditation sessions and self-defense classes. Another first for this year is a partnership with Emory Bread & Coffee House and allowing staff and faculty to donate non-perishable food items to help Emory students in need. Returning favorites include the Canine Assistants (come get a stress-busting snuggle from a therapy dog); the Expo Art Corner, where participants can create art to take home as a keepsake; and the always enjoyable chair massages. Register to attend the Healthy New YOU Expo.